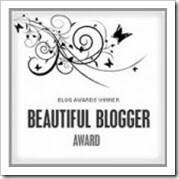 Award-season may be over, but that doesn’t stop the blogosphere from passing on bloggers awards! 2. Today, in an effort to cut back on high-calorie desserts, I baked Lily’s Scones. 3. Yesterday, in an effort to eat a high-calorie dessert, I whipped up a Chocolate Peanut Butter Fudge Sundae. 4. I’m currently reading ‘I Heart New York’ by Lindsey Kelk. 5. I don’t eat fish or coconut. 6. I listen to soul and 90’s r&b music. 7. I finally admitted to myself that I am a complete chocoholic. 1. Birds tweeting when I wake up in the morning. 2. Discovering a new interior store. 4. Getting good deals on things I buy. 6. The smell and taste of really good chocolate. 8. My cats and pets of others. 10. 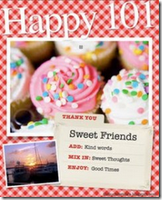 My blogs are a source of happiness! Aw thanks for sharing a bit about yourself. I always like to get to know my fav bloggers a lil better. I'm a total choc and blog-oholic too XD.